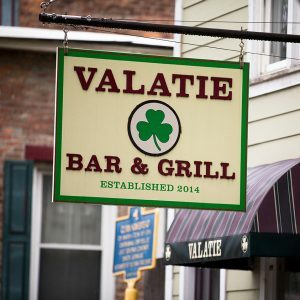 Located in northern Columbia County, NY, The Valatie Bar & Grill is the place to be for great food, cold drinks, live music, quick draw, and top of the line sports entertainment. We offer classic American pub fare with a Latin twist – featuring signature choices such as handcrafted burgers, tacos, and nachos, as well as a fantastic Sunday brunch with bloody mary and other bar specials. We’re fully committed to preparing and serving satisfying food at a good price, so bring your family and friends, watch the game, listen to music, play quick draw, and enjoy a round or two. See our lunch, brunch and dinner menu. Food, Drink, Friends, and Sports. Open late, our bar is fully stocked with the best ingredients for your favorite cocktail, along with wine, cider, and a large selection of domestic, imported and craft beer, on tap and in bottles. Six top of the line Sony televisions mean every seat in the house is a good one. Join us and catch all your favorite games. See our beer and wine menu.